A few words about Limenaria..
“Limeraria” is a beautiful town that is found in the southwest of the island with breathtaking views of the Aegean Sea. It became widely known due to its mines, which was the reason why Limenaria was founded. 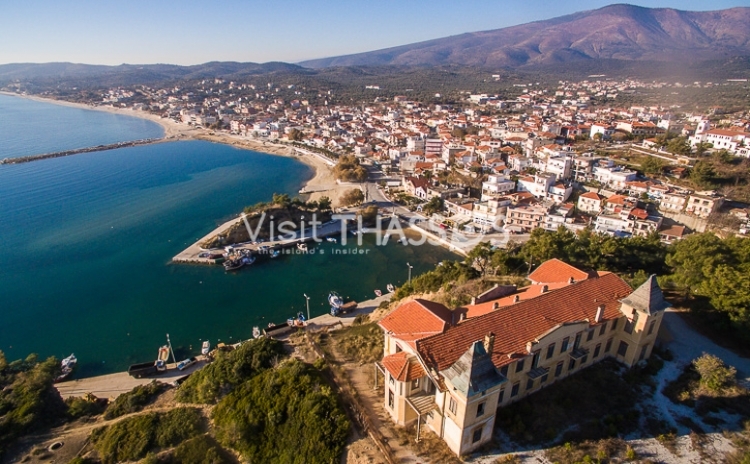 “Palataki” is the most popular site in Limenaria. It resembles a sparkling jewel on a rocky cape and perhaps the most important industrial monument of the Mediterranean. It is an example of central European architecture designed by Italian architect Arigoni. At the top of the hill are the mines’ warehouses, where in summer months visitors can watch a variety of musical and theatrical events. The folklore museum, at the center of the village, houses exhibits such as ceramics, traditional costumes and objects of everyday use of past times. Great variety of tavernas, restaurants and bars can be found around. Limenaria is also well-known for its lively night life. The excellent tourist facilities will turn your stay into an unforgettable experience.